How to care for clip in hair extensions is a question commonly asked, as many with brand new hair want to make sure they are looking after it as best they can so that it lasts as long as possible. In particular, many are unsure how to wash clip in hair extensions and how to dry clip in hair extensions, therefore we have listed our top tips for clip in hair extension care for you. The first step to caring for your clip in hair extensions is knowing how to wash clip in hair extensions correctly. Step 1: Clip in hair extensions should not be washed too often unless they need it, therefore wash your clip in hair extensions around every 6 weeks. Using lukewarm water, soak your hair extensions in the sink or bath to make sure they are wet through. Step 2: Using a hair extension suitable shampoo, gently rub the shampoo into the hair. Rinse the hair in the lukewarm water to remove as much as the shampoo as possible. Step 3: Now coat the hair extensions in a suitable conditioner, ensuring the every strand is covered. Use a hair brush to comb through the hair whilst the conditioner is still in to get better coverage. 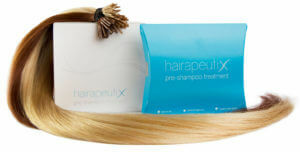 We recommend the Hairapeutix Hairbrush which has been specifically designed for hair extensions. Step 4: Rinse the clip in hair extensions again the water to remove as much of the conditioner as possible. Step 5: Drain the basin, and refill with clean lukewarm water. Rinse the hair extensions again in the clean water to remove any final traces of conditioner from the hair extensions. Hairapeutix Top Tip: Did you know that leaving conditioner on the hair for longer won’t increase how well it works? This is because conditioner cannot penetrate the hair’s cuticle and can only sit on top, which is why it is more important to get total coverage than to leave the conditioner on for longer. Only natural oils can penetrate the hairs cuticle, check out our preshampoo treatment which is the ultimate in hair extension care and conditioning. Treat your hair extensions to deep conditioning. Available in Mini and Ultra sizes. Now you know how to clean clip in hair extensions, the next most common question we are asked is how to dry clip in hair extensions. Here is our step by step guide for drying clip in hair extensions. Step 1: After you have washed your clip in hair extensions, you will want to remove any tangles from the hair by gently brushing. Check out our tips on how to brush your hair extensions, we recommend using a brush specifically designed for hair extensions. Step 2: Once brushed and smoothed through, lay each clip in hair extension flat on a clean towel, and leave somewhere warm, such as a bathroom or close to a radiator. Overnight your clip in hair extensions will dry without the use of a hairdryer, allowing them to retain as much of the moisture as possible, and preventing them from becoming dry from heat exposure. Can I Use A Hairdryer On Clip In Hair Extensions? If you do not have time to air dry your clip in hair extensions overnight, then clip in hair extensions can be blowdried. Step 1: After washing, try to leave your hair extensions as long as you can before blow drying so that they do not start off soaking wet. Step 2: Use a heat protector on your clip in hair extensions, covering each section to prevent heat damage. Step 3: On the lowest heat setting, slowly dry your clip in hair extensions with the air flow blowing down from the clip towards the ends. This will help the hair extensions dry smooth, and will make them easier to brush. We mentioned above that only natural oils can get inside the hair to help make it softer and stronger, therefore preshampoo treatment are great for clip in hair extensions. Simply apply our treatment to dry hair before washing, leaving the product in overnight for maximum exposure, or a minimum of 30 minutes if you are in a rush. Once the product is washed out as normal and you begin to dry your hair extensions, your hair will feel more manageable, softer, smoother, and less frizzy. The key to our product is in helping to replenish the oils your hair extensions do not receive from the scalp, and our clever formula has been designed specifically to meet the needs of hair extensions. Learn more about our Pre-Shampoo Treatment here. If you wear micro ring hair extensions, or any other type of permanent fitting, check out our tips on how to dry hair extensions here. How Do I Dry My Hair Extensions?